Niko Kovac applauded Renato Sanches for making "great strides" psychologically since returning to Bayern Munich from his Swansea City loan spell and suggested he could face his former side Benfica on Wednesday. After emerging as a highly rated prospect at Benfica and helping Portugal to Euro 2016 success, Sanches joined Bayern to great fanfare ahead of the 2016-17 season. But he struggled to adapt and rarely impressed in his 17 Bundesliga appearances, getting shipped out in a temporary deal to the Premier League last term as a result, and he fared no better as Swansea were relegated. Despite his troubles, the 21-year-old has been reintegrated at Bayern, with Kovac speaking highly of him on multiple occasions since succeeding Jupp Heynckes. Although Sanches is yet to feature in the Bundesliga this season, Kovac is happy with him and could use him in Lisbon as their Champions League campaign starts. 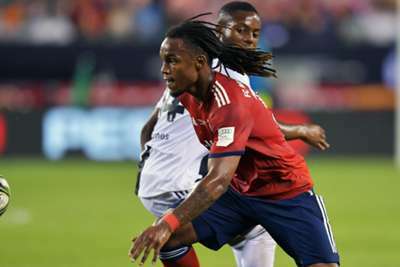 "Renato was good throughout pre-season," Kovac told reporters. "He will certainly play at some time in the near future, possibly [Wednesday]. "He has made great strides, especially mentally and psychologically. He can play football, we know this. "He has not had an easy period. He left his home, his family, went to Germany, a colder country, where people are different and it takes time for these players to integrate. "You have to give the young players the time to integrate. I wish him and us good games. He was away with the national team, which gives an extra motivation. Now he is pleased that he is in his homeland. "We know his qualities, he's a young player who has the potential to evolve and who will certainly evolve and give his gifts to this club, where he will succeed."